Would you believe that I made these last year, from polymer clay, and just remembered them this morning. Whipped on a quick coat of color, added some pretty seed beads, some string and now I have some Valentines ornaments. The one in the first pic, “Believe” is up for grabs. If you would like it, leave a comment. I’ll pick a name on Sunday night and post it in this post. Have a happy, love filled weekend!! The winner is Sketchbook Maggie. Please send me your snail-mail address so I can send that off to you. 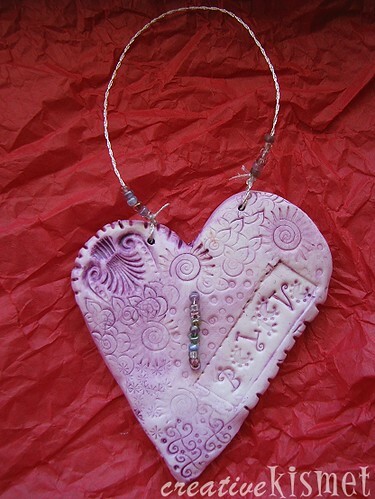 This entry was posted in Misc stuff and tagged beads, hearts, ornaments, polymer clay, Valentine. Bookmark the permalink. This is so cute! I would love to win. Thanks and Happy Valentine’s Day!! Neat! You should make a basic polymer clay tutorial sometime! You are very talented. Those hearts are simply elegant. Love them! What a fantastic idea! 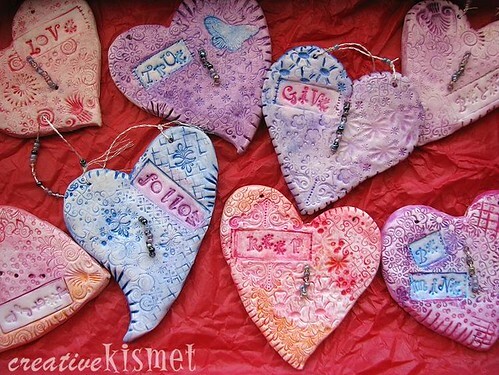 I’d like to have another of your ornaments to add to my creative kismet collection. These are lovely Regina! Happy Valentine’s Day! Pretty! Count me in please. How lucky for us you remembered them! What a darling little heart. It is fabulous! How very cute! Good thing you found them, although I’d hang them up year-round. oh my goodness, these are SO adorable. I would love this handcrafted ornament. you always make me smile. These are lovely and so are you! So sweet. I’d love to have this little heart for my very own!!! Thanks for the opportunity! Me! I want it, I would treasure it!! Your work is gorgeous as usual. The hearts are so very pretty. I’d love to hang one in my kitchen. Thanks for the chance. Naturally I would love, it is gorgeou, but most of all Because You Made It. Gorgeous! I love those tiny patterns with that splash of colour. What a lovely idea. What beautiful hearts!!! My daughters have been wanting to craft with polymer clay. Wouldn’t this be a great project for them? Thanks for the inspiration and chance to win one. Beautiful!! So are the houses from your prior post – gorgeous!! Those are adorable – Happy Valentines Day! I love the hearts. Happy Valentine’s Day. Beautiful stuff -such great texture and detail!!! Just lovely. Hope your valentine’s day is a special one! The hearts are beautiful. Love reading your blog. Thanks for sharing. Happy Valentines Day. Hoping your day was all you wished it to be. These are beautiful-definitely put me in for the drawing! Maybe right before next Christmas I’ll find the two MP3 players I bought for my two youngest kids, but then never saw them again, and can’t find them anywhere! lol! They are really pretty. Please, count me in. so pretty! I would hang it at work. Beautiful! I would hang that on my bedroom wall. So cute! To hearts of all kind, I just seem to relate! Gorgeous. Polymer clay is one of the few media I don’t use, so it’d be cool to have one! Oh I hope I’m not too late! They’re beautiful. I know this contest is over, that is not why I’m commenting. I just wanted to say, I really like your hearts! They have character and charm and would be a pleasure to have around the home anytime of the year! Yes…I’m too late too, but I LOVE these! My kids make beads out of this stuff, but I’ve never thought of it as something I’d want to use……. Thanks for opening my eyes to yet another new craft………!